DefineScope provides training on a wide variety of topics that are related to Information Technologies (IT). From the usage of computers for basic tasks to the development and maintenance of software, and encompassing transverse topics such as software project management, DefineScope’s training programs will allow your company to obtain new skills, increasingly necessary to face the challenges that today’s world presents. DefineScope’s training programs are lectured by elements of our training staff, which have experience in lecturing at a top-level engineering university in Portugal. Contact us, and find out how our training programs will help your company to fly higher! Some details about our training programs can be found below. The lecture contents mentioned are tentative, and will be adjusted to the client’s specific conditions and business environment. For further information, contact us! Meant for employees, with no experience in the use of computers, who need to use a computer for their daily company tasks. Meant for employees that know how to use a computer, and who need to develop software to be used internally by the company. Meant for employees that have a direct or indirect participation in your company’s software development activities. 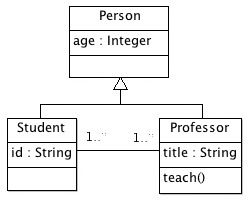 Meant for employees that develop software, know a modeling language (e.g., UML), and wish to learn techniques for developing software based on models. Meant for employees with or without technical knowledge regarding software development.